Rob Hogg Loses Primary, Left Urges Run for Governor?? Last night Rob Hogg lost his statewide primary race for US Senate, but that’s not stopping many Iowa liberals from pushing Hogg to seek a promotion from the Iowa Senate. Hogg was running against former Lt. Governor Patty Judge and lost by nearly eight percent. Judge will now face Iowa’s current Senator, Republican Charles Grassley in November’s general election. For those of you paying attention, Tom Miller, Iowa’s sitting Attorney General is an avowed anti-gunner. He’s openly encouraged Iowa communities to challenge Iowa’s preemption laws and illegally ban lawful carry of firearms on publicly owned property. He’s even gone out of his way to file an amicus brief in favor of New York State’s SAFE Act. The thought of Tom Miller being elected nine times should be enough to make gun owners in Iowa pay attention to down ticket races. But the thought of Rob Hogg serving as Iowa’s next Attorney General ought to be even more attention grabbing. The message is simple folks: you need to do your homework on each and every race in each and every election. The Iowa Firearms Coalition, and our political action committee IFC-PAC are working harder than any other group in the state to make sure elected officials in Iowa stay true to our right to keep and bear arms and do not infringe on your freedoms. But all of our hard work amounts to nothing if you, the people of Iowa fail to do your part. You need to do your homework on candidates. What’s more, if you truly want to see our cause advanced, if you want to see your Second Amendment rights protected and enhanced, you need to get involved. Unfortunately, anti-gunners in Iowa aren’t going anywhere anytime soon. We’ve made real, measurable progress this year. But right now you can bet gun control pushers are doing everything they can to swing the pendulum back the other direction. That includes trying to get anti-gun politicians like Rob Hogg elected to higher office. Rob Hogg for governor in 2018. Take a second and think about that. If it takes you more than ten seconds to come up with a legitimate answer, we suggest visiting www.IFCPAC.com. Iowa Firearms Coalition is an entirely volunteer, grassroots, Second Amendment advocacy group. Responsible for bringing uniformity to Iowa’s Permit to Carry process, IFC’s members work to protect and enhance Second Amendment rights in Iowa. An affiliate of the National Rifle Association, the IFC actively seeks to foster and promote the shooting sports. Sign up for our email list for the latest on Second Amendment issues in Iowa. You can support our work by becoming a member, or making a donation. 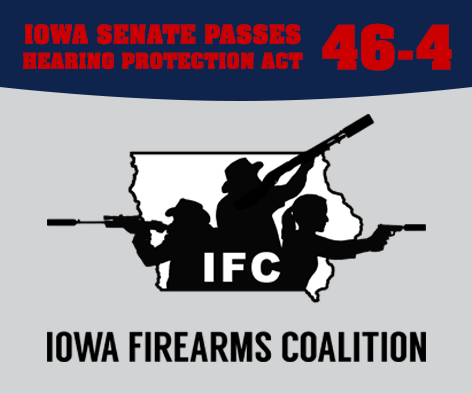 Iowa Senate PASSES Hearing Protection Act 46-4! 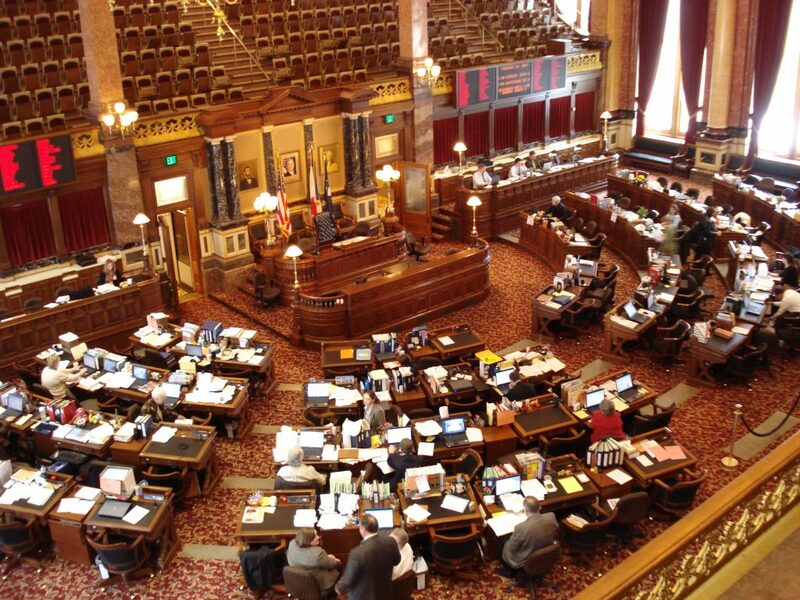 At approximately 9:30 Thursday morning the Iowa Senate passed House File 2279 by a vote of 46 to 4. HF2279, the Hearing Protection Act, removes suppressors from Iowa’s list of so-called “offensive weapons.” If signed into law this would legalize the civilian ownership of firearm suppressors in the State of Iowa. For years the Iowa Senate has a literal dead-end for most every gun bill introduced in the Iowa legislature. When given an opportunity to speak out against the legalization of suppressors in Iowa not a single Senator chose to do so. In fact the only Senator who said anything was Senator Julian Garrett of Warren County who noted how long overdue this bill is and long we’ve been working to legalize suppressors in Iowa. There was an amendment attached by the Senate to HF2279. No need to worry though, the bill’s original intent remains intact. The amendment merely cleanup up a few small grammatical errors. The Hearing Protection Act now goes back to the House of Representatives. The House will have to decide whether or not to approve the amendment. The Iowa Firearms Coalition has been in ongoing discussions with the House leadership and they have indicated they will address the issue in a quick manner. We fully expect the House to approve the amendment and send HF2279 to Governor Branstad’s desk in short order. Tentative indications are the Governor will sign the bill. The Iowa Firearms Coalition has been leading the fight to legalize suppressors in Iowa for years. Along the way we’ve been proud to work closely with the National Rifle Association and American Suppressor Association in the Iowa capitol. Other’s claim to have worked on legalizing suppressors, but we assure you they were no where to be found in the capitol during the numerous subcommittee meetings, lobby days, legislator education days, and so on. If you’re in support of Iowans’ right to own suppressors, you should be supporting those who’ve been fighting to protect and enhance your rights for years. Become an Iowa Firearms Coalition member today! Lawmakers in Ohio have just approved the legalization of suppressors for hunting. The bill is now waiting for Ohio Governor John Kasich’s signature (which he’s expected to sign). Our counterparts in Ohio, the Buckeye Firearms Association, have been working extremely hard to legalize suppressors. Yesterday the Ohio House of Representatives passed H.B.234 by a massive 69-16 margin. Once again we’re seeing that when legislators take the time to thoroughly examine the legalization of suppressors the vast majority of reasonable lawmakers find no reason to oppose such a bill. During the 2014 legislative session the National Rifle Association, the Iowa Firearms Coalition, and the American Suppressor Association all pushed for the legalization of suppressors in Iowa. The bill passed through the Iowa House of Representatives with overwhelming bipartisan support, only to be stopped cold by the anti-gun chair of the Senate Judiciary Committee Rob Hogg. Full details on the plight of last year’s suppressor bill can be found HERE. A bill to legalize suppressors will likely be brought up again in the 2015 legislative session. Fortunately for Iowa’s firearms community Sen. Rob Hogg is no longer the chair of the Senate Judiciary Committee. He’s been replaced by Senator Steve Sodders, of State Center. Sodders has been supportive of some of our pro-2nd Amendment bills in the past, but has opposed others. Remember, the primary role of a suppressor is to reduce the overall sound signature of the host firearm to hearing safe levels. Contrary to popular belief, they do not “silence” or eliminate the noise of a gunshot. Rather, they trap the expanding gasses at the muzzle of a firearm and allow them to slowly cool, in a similar fashion to car mufflers. Their muffling capabilities intrinsically make them a hearing protection device for both the shooter and those around them. 1) Contact your legislators and tell them you want them to legalize suppressors as well as protect and enhance your 2nd Amendment rights. 2) Fill out Senator Steve Sodders’ 2015 legislative priorities survey and make sure he knows that Iowa’s firearms community has high expectations for him. Bonus: Sign up for our email list to for the latest on pro-2nd Amendment bills, and Action Alerts to help advance our cause. CLICK HERE to tell Senator Sodders’ that 2nd Amendment issues are a top priority! 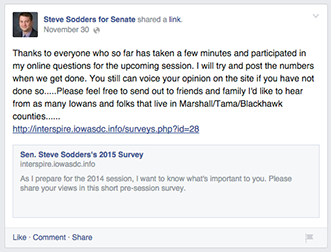 Iowa Senator Steve Sodders is asking for input on what your priorities are for the upcoming legislative session. It’s common for legislators to produce a survey such as this, but this survey is particularly important for Iowa’s firearms community. That’s because Senator Sodders will soon be the chair of the Senate’s Judiciary Committee, this position is a key bottleneck for almost every piece of firearms legislation. As chair of the Judiciary Committee Sodders can determine which bills do and do not get scheduled for votes. We’ve seen this used against us time and time again by the previous chair of the Senate Judiciary Committee Rob Hogg. Please take a minute or two to fill out Senator Sodders’ survey and tell him to protect and enhance our 2nd Amendment rights here in Iowa. Please be honest with your survey answers, but please also remember to act like adults and keep your responses respectful. We look forward to working with Senator Sodders in the upcoming session. If you’re not sure how to answer some of the questions you can skip all of them except the first. To make this easier for the Iowa Firearms Coalition has drafted up answers to the first and last survey question. Please feel free to use them if you’d like. What issue is most important to you in 2015? Protecting and enhancing the 2nd Amendment rights of Iowans. What else do you think I should focus on in 2015? Protecting and enhancing our 2nd Amendment rights. For instance: amending the Iowa Constitution to include a Right to Keep and Bear Arms (RKBA) statement; protecting firearms owners personal information from maliciously being published in the media; legalizing suppressors and other NFA items; maintaining the current Shall Issue rules and requirements for concealed carry; passing a castle doctrine/stand your ground law. I also expect you to acknowledge that my 2nd Amendment rights shall not be infringed upon — more specifically, any attempt at gun control, onerous requirements, restrictions, or alterations to Iowa’s legal code intended to make the usage of firearms any more difficult ought to be opposed. Each of these is an infringement on my rights and a violation of the constitution. Take action now — email your legislators to let them know your stance on 2nd Amendment issues before the 2015 legislative session begins! In just over a month Iowa’s 86th General Assembly will convene in Des Moines. Our lawmakers need to know from the very beginning that we have certain expectations. That’s why we’ve created our Legislative Action Center. It lets you find exactly who your legislators are and makes it easy for you to establish contact with them. If you’re not exactly sure how to put your thoughts into words, we offer pre-written the emails for you to send (CLICK HERE TO TAKE ACTION NOW). This can’t be stressed enough: making frequent contact with your legislators is one of the most effective ways to protect your rights, and the Iowa Firearms Coalition wants to make that process as easy as possible. On January 12th we begin a new legislative session, and with the NRA and your help we plan to chart new territory. In recent years we’ve had limited success passing pro-2nd Amendment bills. It’s not because those bills lacked strong support. On the contrary, they generally had a huge backing. But one anti-gun legislator, Senator Rob Hogg of Cedar Rapids, held a key position in the legislature, chairman of the Senate Judiciary Committee. From there he used procedural measures to block every bill that the Iowa Firearms Coalition and the NRA supported. This year things are going to be different though. Rob Hogg is no longer the chairman of the Senate Judiciary Committee. He’s been replaced by Steve Sodders of State Center. Sodders is a Marshall County Sheriff’s Deputy. In recent years he’s supported some of our bills. But he’s also opposed others. Let’s make sure Steve Sodders knows full well that Iowans believe strongly in our 2nd Amendment rights and will fight any attempt to infringe on those rights. We’ve just activated a pre-session action titled “2nd Amendment supporter looking forward to the upcoming session” in our Legislative Action Center. This is a great tool that allows Iowans to send a strong, pro-2nd Amendment message to Iowa’s lawmakersbefore the legislative session even begins. We’ll be updating the Legislative Action Center as various bills come up during the session, and we’ll be in touch each time we do. As you’ll recall, early in the Iowa legislative session Representative Matt Windschitl (R-HD17) introduced a bill to legalize suppressors. This common sense gun rights measure would have brought Iowa in line with 39 other states that have already legalized suppressors–none of which have seen any reportable increase in crime we might add. Then on February 27th, the suppressor bill came to a vote in the Iowa House of Representatives, where according to the Cedar Rapids Gazette, “a bill to protect Iowans’ liberties and their hearing sailed through the Iowa House Thursday on an 83-16 vote” There were a lot of excited firearms enthusiasts in Iowa. And rightfully so. The bill passed by a bipartisan landslide, with only 16 representatives–all urban Democrats–voting against the bill. Freedom loving Iowans were optimistic. Not only had the suppressor bill sailed through the House, but gun owners had been busy writing their state senators as well, urging them to support the suppressor bill when it moved from the House to the Senate. Statewide, Iowans had received pledges to support the suppressor bill from every single Republican senator and 20 out of 26 Democrat senators. By all measures, it looked as the suppressor bill would pass through the Iowa Senate as easily as it did the House. Nothing urgent about your rights, apparently! Then, as promised, Rob Hogg did nothing. The suppressor bill, with its overwhelming bipartisan support, was never scheduled for a vote in the Senate Judiciary Committee, it never left the Senate Judiciary Committee, and it never came to a vote in the full Senate. In the final hours of the legislative session back in late April, there was one final attempt to breathe life back into the suppressor bill. In the House of Representatives, legislators tied the suppressor bill to an appropriations bill as an amendment. They passed the suppressor amendment back and forth with the appropriations bill, taking it out and putting it back in several times. But when the dust finally settled, it was the Senate Democrats who stripped the suppressor amendment from the appropriations bill and passed it on a straight party line vote. 26 Democrats passed the appropriations bill without the amendment that would have legalized suppressors. Rob Hogg had done his part, procedurally blocking the suppressor bill from coming to a vote in the Senate–meaning all of those Senate Democrats who had pledged to support the suppressor bill would not have to go ‘on record’ voting in favor of restoring the rights of Iowans. Indeed, in the 11th hour of 2014 legislative session, when those same Democrats had a golden opportunity to stand up and make good on their word to support the legalization of suppressors, they all turned their backs on their pledges. Every. Single. One. Of. Them. They stripped the appropriations bill of all language that would legalize suppressors, passed the bill with every single one of their members falling in line, and in the process killed the last chance the suppressor bill had. This isn’t the first time this kind of thing has played out in the Iowa Legislature. Time and time again Rob Hogg has used his chairmanship of the Senate Judiciary Committee to play politics and block bills that would restore your rights. Stand Your Ground, a Right to Keep and Bear Arms amendment to the state constitution, gun owner privacy protection, legalization of suppressors…ALL of these bills have passed the House but died in the Senate. We’ve tried for years to work with the Senate Democrats and find another way to pass these bills, but they fail to come around. Their actions have truly spoken louder than their words. Election day is near at hand. The Iowa Firearms Coalition has been and remains bipartisan, but history has made it painfully obvious that Senate Democrats are not interested in working with us, so it’s time to make a change. If we expect any further progress on restoring gun rights in Iowa, we MUST make a change: We must flip the Senate to a Republican majority to get anything done, plain and simple. We need your help to make this happen. Voting is the very least you can do. We need is for you to talk to your friends, your co-workers, your hunting buddies and tell them what you’ve learned here, how so many gun rights bills have been killed in the state senate. But we also need more than just talk, we need you to donate, and we need you to volunteer. Your time and money will help us make a much-needed change in Des Moines. We don’t know what the future holds, but we know what we’ve seen in the past, and its high time for a change. If you’re frustrated with the lack of support you’re getting in our state capitol, please join us! He says if it’s such a big deal, he’d like to see it as a campaign issue in 2014 so that the voters can have a say. “I don’t think there was a single campaign in 2012 where the legality of silencers was an issue,” said Hogg. This was big news exactly four months ago… let’s make sure Senator Rob Hogg hears the message loud and clear AND loses his precious Chairman of the Senate Judiciary Committee seat. Don’t forget, last session our suppressor bill passed the House of Representatives with more than 80% support from both sides of the aisle. In the Senate we had pledges of support from every single Republican and 20 out of 26 Democrats. But none of that mattered to Rob Hogg. It didn’t fit his agenda, so he let the suppressor bill sit in the drawer and never come to a vote in his Senate Judiciary Committee. If this ticks you off, volunteer just a couple of hours with us and help us Stand and Fight!